Check Out Topaz Clarity – and save a few bucks! Readers of my blog, as well as those who come on my workshops, know that I am a big fan of plug-ins – because plug-ins can help you awaken the artist within. My latest (just launched today) and favorite plug-in is Clarity from Topaz Labs. So far, I have been using Clarity to create stronger images. 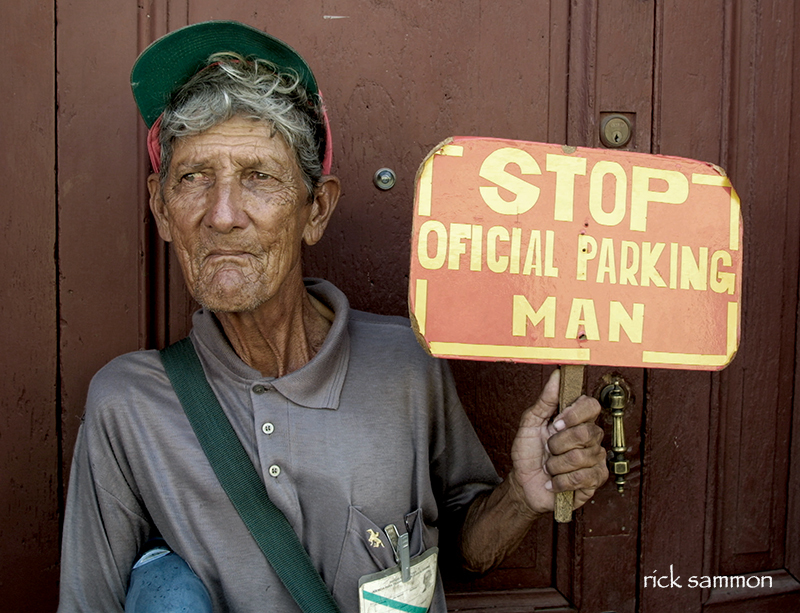 This before-and-after set of images of Official Parking Man in Old Havana, Cuba is one such example. Compare the image below (original) with the image above (enhanced). Notice the increased detail in the wall behind the man, as well as the increased structure in the man's face. To add the texture and "a look" to the image, I used the Documentary filter in Clarity, which gave the photograph a stronger look and feel. Above is a close-up of the man's face. Clarity increases details in an image without creating halos, which can creep into an image when adding this type of enhancement. That's very cool. Above: One viewing/working option in Clarity is to see your images side-by-side. That's the way I like to work (and play). Above: Cool controls in Clarity include: Hue, Saturation, Luminance, Dynamics and even Masks! Plus there are tons of pre-sets to get you going and to give you some creative inspiration. Clarity Sale, Discount and Download: Until May 31, use the code - claritynew - and get Clarity for only $29.99. After that date the price goes to $49.99. You can download the cool plug-in from the Topaz site. Go to Products and select Clarity. While you are on the Topaz site, use my discount code - rsammon - and save 15% on other Topaz plug-ins . . . and save a bundle on a bundle. As long as I'm talking about Topaz Labs, Topaz Adjust is another favorite artistic plug-in. I usually use it to remove some of the reality from an image. When you remove some of the reality from an image, a photograph can look more artistic and more creative. Above: I used The Lomo II filter in Topaz Adjust to remove some of the reality from the image on the left. 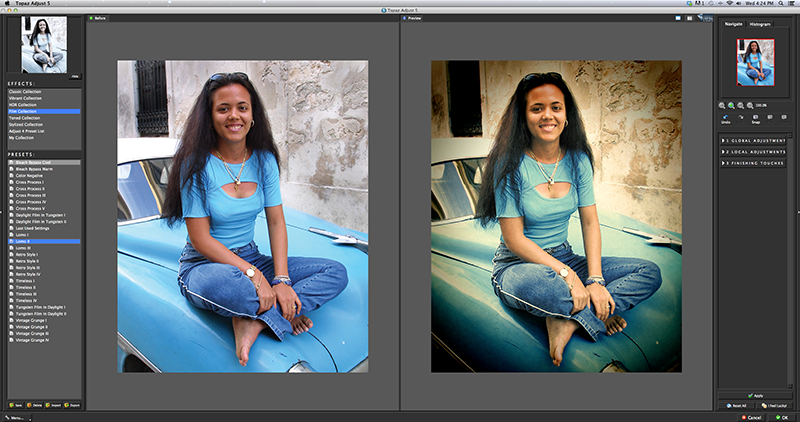 I photographed the young woman in Old Havana Cuba, too. Above: All Topaz plug-ins offer easy-to-navigate windows for . . . that's right . . . easy navigation. My favorite plug-ins are listed on my Save on Plug-Ins page. Check 'em out and save a few bucks. P.S. Plug-ins are, indeed, cool. But you must start with the best in-camera image, which starts with a good exposure and good composition - stuff I talk about on my on-line classes. Here's a fun shot of me in Old Havana, Cuba. 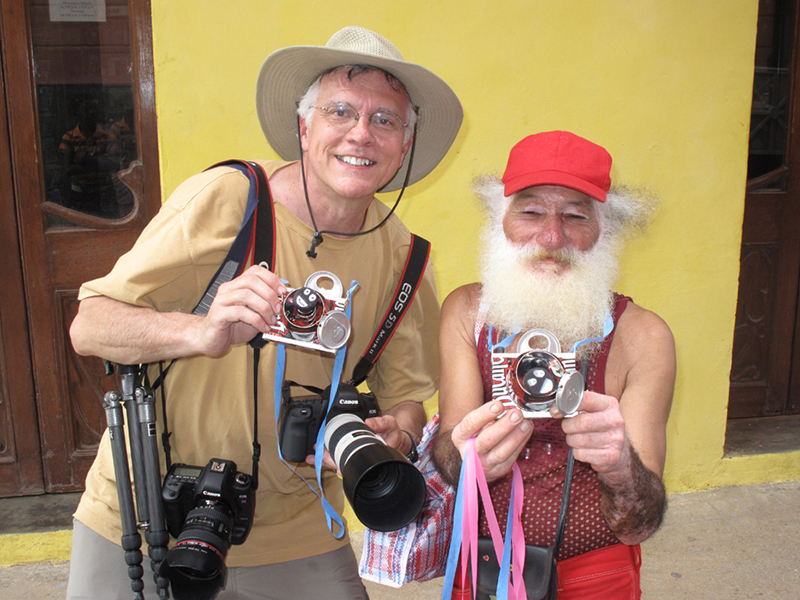 The man makes "cameras" out of beer cans. For street shooting, I usually travel with two Canon 5D camera bodies and two zoom lenses: Canon 24-105mm IS and Canon 70-200mm. All my gear is listed on My Gear page.